PS is an amorphous polymer with a density of around 1.04g/cm3, AKA standard plastic. With favorable fluidity and a low water absorption rate (lower than 0.02%), it is a transparent plastic material that is easy to plastic injection molding process. PS product’s light transmissionrate are typically as high as 88 – 92%, with strong tinting strength and high hardness; It is also non-toxic and odorless. However, PS products are highly brittle, stress cracks tend to appear (may be checked by soaking or wiping with kerosene); poor thermal resistance (60～80℃). Ornaments, illuminated signs, lampshades, stationery, transparent toys, daily necessities, kitchen supplies, cups, meal boxes, cassettes and mirrors, etc. The melting point and decomposition temperature of PS are 166℃ and 280℃ respectively. Thanks to its good fluidity and the low flow resistance, the injection pressure can be a little lower. As the PS features a lowspecific heat, the produced parts can soon solidify after mold cooling. Its cooling speed is higher than other materials, so mold open time can be earlier. Both its plasticizing time and cooling time are a relatively shorter, leading to a shorter molding cycle. Internally stressed plastic parts can be soaked in 65 – 80℃ water for 1 – 2 hours, then gradually cooled to the room temperature, and the internal stress can be removed. The barrel does not need to be cleaned after the machine stops, because the PS itself can be used as the cleaning agent of other plastic materials. ABS is an amorphous polymer with a density of around 1.05g/cm3. Its overall performance is great, with high mechanical strength, excellent impact resistance, certain surface hardness and anti-abrasion properties. Its heat resistance is as high as 90℃ (even able to be used under the 110 – 115℃ temperature conditions); good low temperature resistance (able to be used under the -40℃ temperature conditions); and allowing easy processing and easy electroplating. But it has poor solvent resistance; easy to age when exposed to UV rays; low extension rate. ABS features a diversity of varieties and an extensive range of applications, so it is also known as “general purpose engineering plastic”. Electronic product parts, toys, casings and daily necessities, etc. (1) ABS has poor moisture absorption and temperature resistant properties. Before the molding process, it must be dried and preheated thoroughly, to keep its moisture content below 0.03%. (2) The proper injection molding processing temperature of ABS is normally kept between 210 and 250℃. (3) The best effect will be achieved when ABS is used for injection production at a medium injection speed (unless the structural complexity and thickness of the product require a higher injection speed. Gas marks tend to appear around the gate of the product. (4) ABS should not stay for too long inside the high-temperature barrel (should be kept less than 30m), or it will easily decompose and turn yellow. When changing from another material to ABS, the plastic injection machine needs to be cleaned with PP or PE. PMMA is an amorphous polymer (commonly known as Acrylic), with a density of around 1.18g/cm3. It is extremely transparent, with a light transmission rate of as high as 92%; featuring good thermal resistance (heat deflection temperature is 98℃) and high hardness. But, if it is used as an optical product material, the surface will be easily left with scratches. Its biggest weakness is brittleness (better than that of PS). 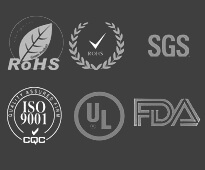 Lampshades, window glasses, signs, optical lenses, contact lenses and automotive parts, etc. PMMA has stringent processing requirements. As it is very sensitive to moisture and temperature, thorough drying is required before molding. The molten PMMA is highly sticky, so it needs to be processed under high temperature (190 – 240℃) and high pressure conditions. It is better if the mold temperature is kept between 65 and 90℃. PMMA does not feature a good thermal stability, so degradation may occur when it is put under high temperature or stays in a high temperature environment for too long. “Hollows” tend to appear inside thick PMMA products, so it is better to be processed using a big gate and under the “high material temperature, high mold temperature and slow speed” injection conditions. 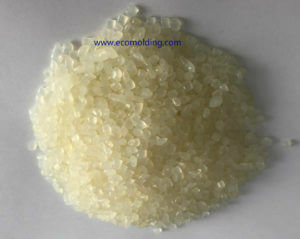 PP is a crystalline polymer, with a density of as low as 0.91g/cm3. Among the commonly used plastics, PP is the lightest; and among all general-purpose plastics, PP is the most thermal resistant – its heat deflection temperature is 80 – 100℃ and can be heated in boiling water. PP features a strong stress crack resistant property and bending fatigue resistance, and it is also commonly known as “polypropene”. PP is lightweight, with good toughness and chemical resistance. PP weaknesses: low dimensional accuracy, insufficient rigidity, poor weatherability. It ages and thus becomes brittle easily. During the application process, long time contact with copper should be avoided, so as to prevent the “damage by copper”. PP possesses good fluidity under the melting temperature, with great molding capabilities. High molecular orientation, leading to high shrinkage rate. It is better that PP processing temperature is kept between 200 and 250℃, as it shows excellent thermal stability (decomposing temperature is 310℃). To improve shrinking deformation and dents, the mold temperature should be kept between 35 and 65℃. The crystallization temperature of PP is 120 – 125℃. The molten PP is able to flow through the narrow gaps in a mold, thus causing flash. During its melting process, PP will absorb a large amount of heat of solution (high specific heat), so the product is very hot after the mold opens. The PP material does not need to be dried when processing. The shrinkage rate and crystallinity of PP is lower than that of PE. Commonly known as nylon, PA is also a crystalline polymer, with a density of 1.13g/cm3. Among its diversified varieties, the nylon materials that are used for injection molding typically include Nylon 6, Nylon 1010 and Nylon 610 etc. Nylon’s advantages include high mechanical strength, high toughness, as well as fatigue resistance, smooth surface, self lubrication, low abrasion coefficient, resistance to abrasion/heat (allow long-term use below 100℃), corrosion resistance and easy processing, etc. PA weaknesses: easy water absorption, imposing stringent requirements for injection molding, poor dimensional stability, and very hot product upon mold ejection due to the high specific heat. Among the PP materials, PA66 has the highest mechanical strength and enjoys the most extensive scope of application. Thanks to its high crystallinity, both its rigidity and thermal resistance are very high. High temperature electric socket parts, electric parts, gears, bearings, rollers, pulleys, spring supports, screws, impellers, fan blades, propellers, high pressure seal gaskets, valve carriers, oil pipelines, oil containers, cables, cable ties, driving belts, grinding wheel adhesives, battery boxes, electrical insulator parts, wire cores and wires, etc. Due to its high moisture absorption rate, PA must be dried before processing, to bring its moisture content below 0.25%. The drier the raw materials, the better, then the surface gloss of the product can be guaranteed, or it will be very rough. PA will not soften with the rise of temperature. With the obvious melting point, it will flow the moment the temperature reaches the melting point (different from PS, PE and PP etc. ); one of the rheological properties of the nylon material is that its stickiness is not sensitive to shear rate. Due to its high fluidity, though PA fills the mold easily, flash or burrs tend to occur. PA features both high melting point and freezing point. The molten PA can become solid at any time with the temperature falling below the freezing point, which hampers the filling and molding process, causing nozzle or sprue blockage. Therefore, high speed injection must be adopted (especially for thin-walled products or long running productions), so as to minimize pressure holding time. In addition, nylon molds need sufficient ventilating measures. Molten PA has poor thermal stability and is prone to degradation. Normally, the barrel temperature should not exceed 300℃, and the molten material should not be heated in the barrel for more than 30m. PA imposes high requirements for mold temperature. Its crystallinity can be controlled by mold temperature, so as to acquire the desired performance. It is better if the temperature of PA injection molding can be kept between 50 and 90℃. Sometimes, a PA product needs “conditioning”, to improve its toughness and dimensional stability. POM is a crystalline polymer, with a density of 1.42g/cm3. It features high rigidity, and is also called “Acetal”. It possesses many advantages, like fatigue resistance, abrasion resistance, thermal resistance and impact resistance, etc., with a low frictional coefficient and great self lubricating properties. Its heat deflection temperature is 172℃. POM does not absorb moisture easily, so it maintains excellent dimensional stability in a moist environment, with a shrinkage rate of 2.1%, so it is not easy to control the dimensions during the injection molding process. POM + 20%GF (glass fiber), shrinkage rate = 0.5%-1.5%. Able to replace most of the nonferrous metals, vehicles, machine tools, instrumental internal components, bearings, fasteners, gears, leaf springs, pipes, delivery belt components, electric boilers, pump shells, grids and tap faucets, etc. Before processing, the POM material does not need to be dried, but it is better be preheated (at approx. 80℃) during the process, which will benefit product dimensional stability. The processing temperature range of POM is limited between 195 and 215℃. It will decompose if staying in the barrel for too long, or the temperature exceeds 220℃, generating strongly irritant formaldehyde gas. During the injection molding process of the POM material, a high packing pressure is needed (close to the injection pressure), to minimize pressure drop. The revolving speed of the screw cannot be too high, and the residue should be kept as little as possible; POM products feature a high shrinkage rate, and are prone to shrinkage or deformation. With the high specific heat and mold temperature (80 – 100℃), POM products are very hot upon mold injection, so it is necessary to prevent your fingers from being burnt. Ideally, POM needs to be molded under the “medium pressure, medium speed, low material temperature and high mold temperature” conditions. When producing precision products, a mold temperature controller is needed to control the temperature of the mold. With a density of 1.2g/cm3 and excellent transparency, PC is commonly known as the bulletproof plastic. It possesses an outstanding overall performance that is characterized by “toughness and rigidity”, with high mechanical strength, great toughness, extremely high resistance to impact, outstanding thermal resistance & weatherability, accurate dimensions and high stability. Besides, it is also non-toxic and odorless. The thermal deformation temperature of PC is between 135 and 143℃, allowing long-term application under the 120 – 130℃ temperature conditions. PC weaknesses: Poor chemical resistance, low fluidity, sensitive to moisture, and prone to internal stress cracks, etc. High temperature electric products, air blower shells, transformer casings, electric tools, motor casings, tool boxes, milk bottles, beverage dispenser casings, camera parts, safety helmets, gears, food trays, medical devices, ducts, hair pins, hair dressing tools, shoe heels, structurally stronger engineering parts after being fiber reinforced, and CD discs, etc. The PC material is very sensitive to temperature – the stickiness of the molten PC apparently falls with the rise of temperature, leading to a faster flow speed; but it is not sensitive to pressure. To improve its fluidity, the faster way is to raise the temperature. Before processing starts, the PC material needs to be dried thoroughly (at 120℃), to keep moisture content below 0.02%; the appropriate molding conditions of PC is “high material temperature, high mold temperature, high pressure and medium speed”. The mold temperature is better be controlled between 80 and 110℃, while the ideal molding temperature is between 280 and 320℃. Gas marks tend to appear on PC product surface and the gate, and high internal stress will lead to cracks. Therefore, the PC material imposes high requirements for processing. With a low shrinkage rate (approx. 0.6%), its dimensional changes is minimal; the PC injection molded products can apply the “tempering” process to remove the internal stress.